After a breakfast catered to your taste and served at your leisure, relax in a hammock under the shade of a palm tree or let the sun perform its golden magic on your skin while you study the waves. Experience one of the world’s most beautiful displays of sealife while you snorkel or explore the vast shades of blue in an ocean kayak. This luxury oceanfront home located in Puerto Aventuras, Mexico, is just 45 minutes south of Cancun’s international airport and is in the heart of the Yucatan’s majestic archaeological sites and natural parks. Just 5 minutes walking distance to the village of Puerto Aventuras and its world-class marina. 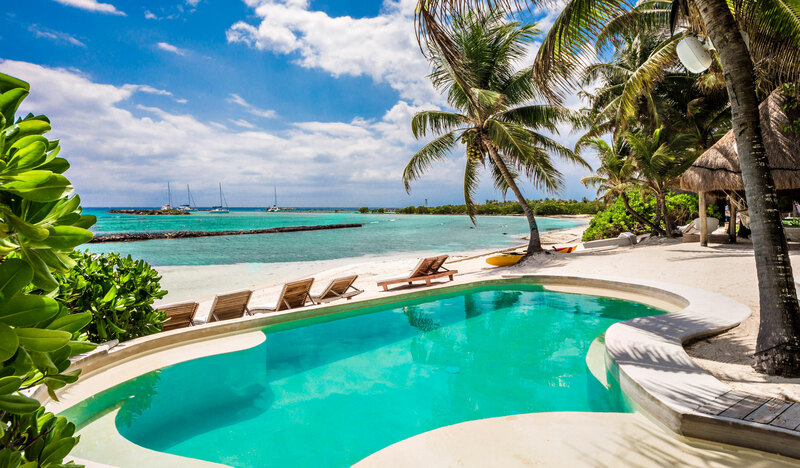 Casa del Agua is secluded, with only 2 private residences for neighbors, yet is ideal for those who enjoy golf, deep-sea fishing, scuba-diving, fitness activities, and shopping conveniently within one resort. Nearby sites of interest include Playa del Carmen, Tulum, Xcaret, and Cozumel. Each suite offers tropical garden settings, private bathrooms and air conditioning. Beautifully handcrafted furniture, doors and windows combine with colorful hand-woven Mexican textiles to create the ultimate in Mexican Caribbean luxury. Some of our guest suites have private terraces and offer ocean and jungle views. Mini bars and safes are in every guest suite for guest convenience. The common area that all guest suites share features a voluminous 40-foot thatched roof that is truly breathtaking. Folding doors and windows open onto our large terrace adjoining the common area and offering unforgettable views of Casa del Agua’s private beach and the turquoise waters of the Caribbean. **Please note that although the beach at Casa Del Agua is sandy, the entrance to the water is rocky. Guests are provided with “water shoes” for water access. Many parts of the bay in front of Casa Del Agua are ideal for swimming and snorkeling, perfect for reflecting on the ocean.